Our spacious 2 bedroom apartment has a master bedroom with an en-suite bathroom, walk-in wardrobe and a king size bed. 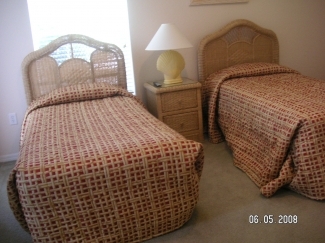 A twin bedded room with an adjacent bathroom. There is a large kitchen with side by side fridge freezer, dish washer, microwave, ceramic top hob, oven and place settings for 6. 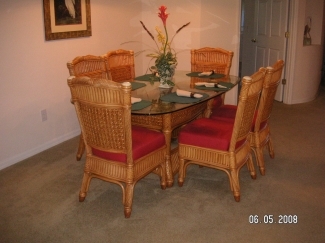 There is an easy chair and a sofa bed,dining table with six chairs. On the patio there is a table with four chairs. The apartment is close to Lake Davenport,the lakeside restaurant which has a bar a snack bar and pool tables. Between the restaurant and the lake is the man made beach with the volly ball court and large swimming pool. 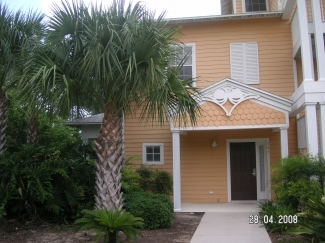 Bahama Bay is set in 70 acres of lakes and tropical gardens with 2 club houses. There is a beauty salon, a shop a gym, kids play area walking trails tennis and free internet. The complex is just to the south of Disneyworld about 15 minutes drive. there is also a shuttle bus service should you need it. 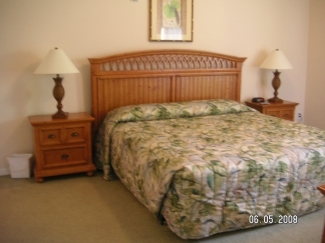 These prices include the local tax, the exit cleaning charge on stays of 7 nights or more. Cleaningcharge of �46 for short stays.